Posted On June 05, 2014 by Team iCynosure. A couple of months ago I reviewed a great hair care range and thought to myself, "I've finally found my amazing magic portion" as it revitalised my hair with a natural shine reducing hairfall, giving my crowing glory wings of its own to fly. Just as I was living my dream fantasy I was sent a review package of another hair care product range, TRESemmé. My first thought at receiving the TRESemmé Split Remedy system was ... "Nah. Not now, let me stick to what has worked wonders for me". Happy with the way my hair had shaped up in the last month I decided to give the new range a miss and there it sat on the bathroom shelf for family and friends to use. However, faith had other plans. With an amazing history with TRESemmé and experimenting with the Ramp Ready Hair, I finally gave in to my impulse and tried the range. What is TRESemmé Split Remedy all about? TRESemmé Split Remedy system claims to gently cleanse and moisturize hair in a way that it becomes healthy-looking and manageable while reducing split ends up to 80% after a few uses. This unique system uses an innovative Reconstructing Complex and binds split ends, thus over a period it fixes the damage as and when it occurs. What are the Key Ingredient? The Innovative range contains Silicone, Amino-Vitamin Blend and conditioning ingredients. All these ingredients from the formulation work in synergy to reduce split ends of the hair fibre. The Silicone in the formulation has the ability to form a lubricating layer on hair fibre. When hair is treated with shampoo and conditioner this layer helps to coat hair fibre to help bring hair fibres and split ends together. This layer also helps to reduce friction between two fibres and improves hair alignment. The blend of Vitamins - Vit H, Vit B3, Vit C and Vit E along with lysine, polyelectrolyte complex (oppositely charged polymers) work towards bringing split ends together. How is the Range packaged and priced? The range is packed in easy to use flip-cap, contrasting black and white bottles. Available in various sizes, the 90 ml bottles work best as they are convenient to store and travel-friendly. The range is priced economically at INR 175 each for 215 ml. 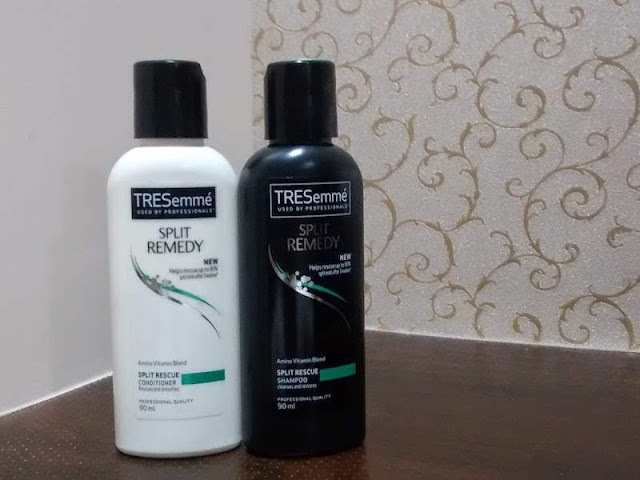 My first impressions of the TRESemmé Split Remedy seemed like any other haircare product range but giving it time was the best decision ever. Over a period of a couple of weeks, I realised it is a product made for the professionals but aimed for everyday use by everyone. A salon professional range, both the shampoo and conditioner are a consistent thick texture and mildly fragrant. The shampoo is near perfect doing everything that is expected of it. It lathers and foams great and is needed in little quantity as it cleanses both dirt and oil in two washes. The conditioner is perfect for my hair type as it doesn't weigh my hair down. With the formulae, it does mend the split ends and gives it a salon-like feel. With carefully infused ingredients like Amino-Vitamin Blend, Keratin and Bition the range is a winner on it's own. However, for some, the presence of Sulphate may be a dampener due to the huge debate going around on the effects of sulphate on hair. I usually trim my hair once a month to avoid split-ends and keep my hair healthy and strong, but after using the TRESemmé Split Remedy range I don't feel to go under the knife every monthly. Using the range for a few weeks has definitely reduced split ends giving me sleek, visibly smoother hair with almost mended split-ends. It feels like the product seeks to repairs split ends that cause rough and damaged looking hair. The technology works to give me smoother, less frizzy look that ensures I don't have to cut the beautiful ends short! Will I recommend the range to my friends and family? Sure thing! So I'm all set for salon style hair at home every day! Are you? Leave me your opinion about the range if you've used it. Shoot any queries or drop in your suggestions.